Uh, I can't open the link. It is empty. Or am I too early? Hmm, no fix to Spooks showing up early in Act 1 Epsilon Mission "Landlocked"? Still weird that they are there without explanation and then disappear until Act 2. Also dang, nothing related to campaign, new missions or making some old missions easier. Well, there's always next time. Edited by Solais, 04 February 2017 - 08:56 PM. OK. OK. I like what I see. Only things are reduce harbinger damage more and please remove the seeking effect from the irkallas fireballs.? that is literally my only wishes. otherwise, get this out ASAP. Edited by Death_Kitty, 04 February 2017 - 08:57 PM. It's there but perhaps your browser is seeing the old page. Very nice! Almost all the bugs I recall seeing in the bug report thread are going to be fixed. What about the radar in Peace Treaty? Boid Blitz will now have a voice notification instead of just a sound effect... Can you do the same for Great Tempest (and possibly Blasticade)? Now it seems to be the only super weapon that doesn't have a voice notification. I haven't checked about Blasticade yet but most likely it doesn't have a voice notification either. It's not the only superweapon without a voice notification because none of them has one in Mental Omega. They're all sound effects. My thoughts for the stuff so far. Bug fixes are always good, so no explanation needed. The Tsurugi and Sentinel ones I like the most. All are great, especially the Basic Cannon thing. Maybe now more players will see value in basic tanks. It's about time EA got some improvements. And no more Chrono MADMAN either. Perfect. -Been waiting for Foxtrot nerfs for so long. -I'll miss the good old Wallbuster, but its nerfs were justified. Besides, not many players really used it well anyways. -Iron Guard ferf was for the better. -Nuwa price buff was something surprising to me. It was quite nerfed after all. -A really good change for the Dustdevil. I do wonder if others will use em sometimes, though. -Gyro, Deso, and Erad buffs are great, but the biggest surprise to me was the Qilin buff. Then again, we should expect the most expensive basic tank to be worth something. -I love all the nerfs here, especially Rahn's and the Tyrants. -Attacker/Evolver buffs seem more worthy. Hopefully they'll be used more. -Really hope this will help Genomines be useful for a change. -I did worry about the Marauder buffs, but it should be okay as it seemed like most Psi Corps vehicles were mostly poorly armored, and for Marauders to be of that price and greatly fragile seemed problematic. All nerfs I like. My favorites would have to be nerfs to Megalodon, Pteranodon, Fin and Alize, MADMAN, and Zorbs. -Pteranodon: My biggest concern was that their power, heavy armor, and durability would mostly, if not completely dominate the Soviets in groups due to what I said before, and Soviet AA, excluding the Catastrophe, Wolfhound and Centy, does poor damage against heavy-classed armor, and the only true protection they got is Iron Curtain/Guard and Flak Troops, but said Pteranodons can easily avoid them with their speed and depending on the map, and Zorbs can rid of Flak troops. -Zorbs: Their nerf is great, but my only worry is how fast Floaters can heal. -Shadray: They did seem powerful against anything except aircraft, and yet their nerfs were righteous. Honestly I always thought that Sonic technology would be weak against tanks in the first place. -Duplicant: Hopefully this buff will help em be used more often. -Knightframe: It is true that they're supposed to be the most powerful of basic infantry, but I always did worry that an early Foehn rush would completely dominate Soviets unless they have Bunkers (Sentry Guns don't seem as potent as Pillboxes) or are in urban maps. -Giants/Godsbanes: Really like the nerfs. I still worry that the Godsbanes with their fibers causing stun can make it hard for even anti-infantry infantry to take on a group of both banes together. This is what's on my mind for now, and am looking forward to the changes (Yay Qilin and Gyro buffs). Hopefully the Sniper ROF buff won't make Human Shield and a bunch of other missions impossible to beat (because by the time you come close to MC/kill him, he'll most likely finish with killing the second distraction GI). For superweapons, I'd rather have a generic, but unique sound alarm, to help with differentiating them from support/recon abilities. Or perhaps the generic alarms should have 3 unique different sounds: for SWs, for support and for recon abilities. Edited by Damfoos, 04 February 2017 - 11:00 PM. here are my thoughts on the buffs and nerfs so far for the four factions. Allies: i actually think the tier 3 epic units being not able to be chronoshifted( i am looking at you MADMAN) is a good nerf, and though i have no problems with allies so far, i think they need more buffs since allies have no epic units ;_; so yes i accept these buffs. Epsilon: Tyrants i don't think need to be more expensive anyway( they are scorpion cell vehicles, and scorpion cell relies on spamming their own vehicles anyway), Rahn and the salamanders need proper balancing though, so yes i believe they need the nerfs. Gehennas definitely must need the buffs, since people are complaining about their AA capabilities. The rest of the buffs are OK overall. Foehn: About bloody time Foehn needs a hit with the nerf bat. The HP nerfs for foehn infantry need to be stronger though(but don't nerf too much as they still need to better than the original three faction's infantry obviously). The haihead tier 3 ground vehicles nerfs are good, though diverbees need nerfing too. For coronia the Pteranodons nerfs need to be a bit more severe, but other than that they are fine. last bastion nerfs are fine so far. The reprocessor at least doesn't give money for defense kills, but the money it gives per kill should be decreased too. Overall it looks good but can use more suggestions. Edited by Nicholas Chau, 05 February 2017 - 01:49 AM. "Mommy, I want a new Stinger! Waaaaaaa~h"
Isn't that what humvees are there for? Edited by Handepsilon, 05 February 2017 - 03:00 AM. To be honest, far more missions need to be made easier on Easy than just Firewalking, especially in Act 1, but yeah, Firewalking was the only Act 2 mission so far that I skipped. You should not be. If you opponent tries anything remotely resembling a tank blob you will destroy it like that: *snaps fingers* with the nerfs to the rest of their arsenal, eureka will work well with the pteronodon. As all of colonies stuff flies, no need to worry about friendly fire. Throw a few of those artyies and your all set. Edited by Death_Kitty, 05 February 2017 - 01:47 PM. Yeah right, as if said tank blobs don't have anti-infantry units.......Get close, make a blast and die immediately, sure. Great suicide hero. At least Chitzkov is fast and untargetable while jumping........Eureka just kinda sit there asking to be shot at due to the fire delay. That is the problem. Any group of fast vehicles will evade the blast and destroy her before she can even retaliate. Edited by X1Destroy, 05 February 2017 - 02:30 PM. Chitzkoi*, also you do realize that Eureka works with spinblade boost? She can jump in, pop a wave and get out of there easily. 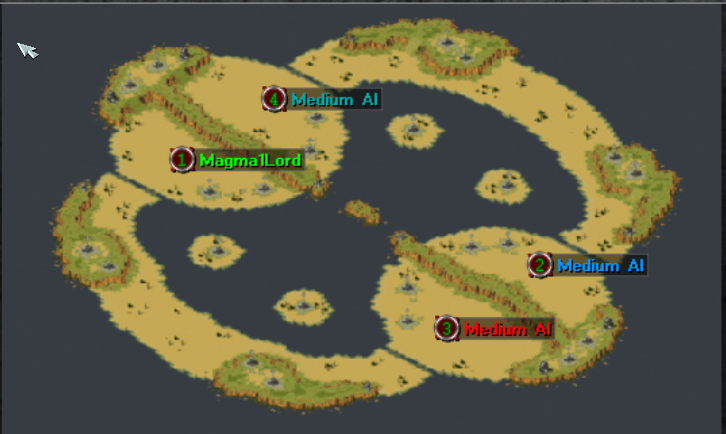 is it possible to make the skirmish map Aqua Speculum, accessible for all the other modes?